Creating a niche of Oncology Medicines such Nublexa Regorafenib Tablet, Alimta Injection, Zytiga Tablets, Jevtana Injection, Cellcept Tablets, Everolimus, Avastin Injection, Aprecap Capsules, Neulastim Injection, Sutent Capsules and many more items at its best, with utmost quality. Uses:- Abiraterone Acetate Tabletsis used for treating a certain type of prostate cancer that has spread to other parts of the body. It is used along with another medicine (prednisone). It may also be used for other conditions as determined by your doctor. 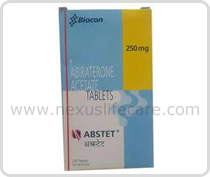 Abiraterone Acetate Tablets is an androgen biosynthesis inhibitor. It works by decreasing levels of certain hormones produced by the testes. This helps to prevent the growth of certain tumors that need these hormones to grow. Abiraterone Acetate Tablets available as Zytiga 250mg tablet, Xbira 250mg tablet, Abstet tablet, Zecyte Tablet, Samtica 250mg Tablet, Abirapro 250mg tablet. Side Effects:- Cough, diarrhea, heartburn, hot flushes, joint swelling or pain, mild muscle discomfort, tiredness, vomiting, weakness.